Popular, lightweight and very strong, this long-reach lance sprayer is designed to be used in a wide range of situations around the home and garden. Includes a 7 pattern head, 12 angle settings, flow control, lockable trigger and comfort grip. 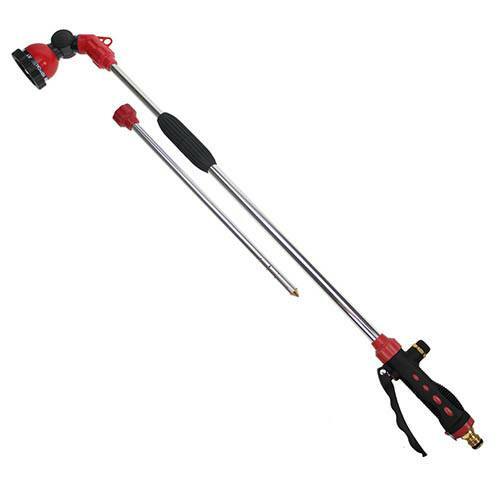 Extending from 85cm to 120cm with an adjustable angled head, this telescopic spray lance will increase your reach enabling you to water higher items such as baskets with ease, as well as into deep borders, making it the perfect watering accessory. Includes a 7 pattern head, flow control, lockable trigger and comfort grip. The head angle can be adjusted to 12 different angles making it ideal to water hanging baskets without balancing on steps. The Spray wand comes complete with an integral root waterer so that you can send water directly to the roots. Simply unscrew watering lance from handle and screw on root watering spike. Takes water directly to the roots, as deep as 30 cm if required. This avoids wasting water from both evaporation and run off and gets the water to exactly the right place. along with fan, cone and centre applications.